In the aftermath of two recent shockers, first the company's surprise announcement that it would stop reporting iPhone, iPad, and Mac unit sales, which correctly led some analysts and investors to believe that something was amiss, followed by the unprecedented Jan 3 stunner, when the company cut guidance only for the first time in 18 years, warning that instead of hitting its $89 billion to $93 billion target it would report earnings of $84 billion, it is safe to say that Wall Street's expectations for Apple's fiscal Q2 earnings were not high. 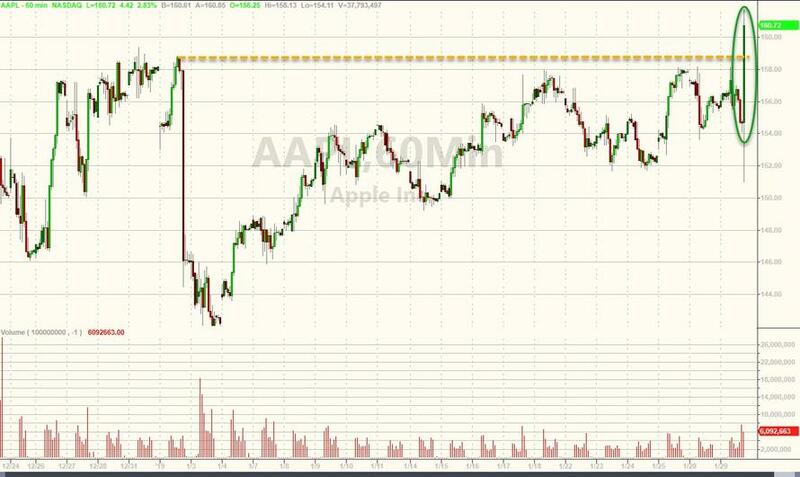 Which is probably why Apple stock appears to be happy that there were no more shockers in the just released earnings, which while a far cry from the company's historical massive beats, did beat Wall Street sharply lowered expectations modestly, which appears to be sufficient to keep the skeptics at bay. 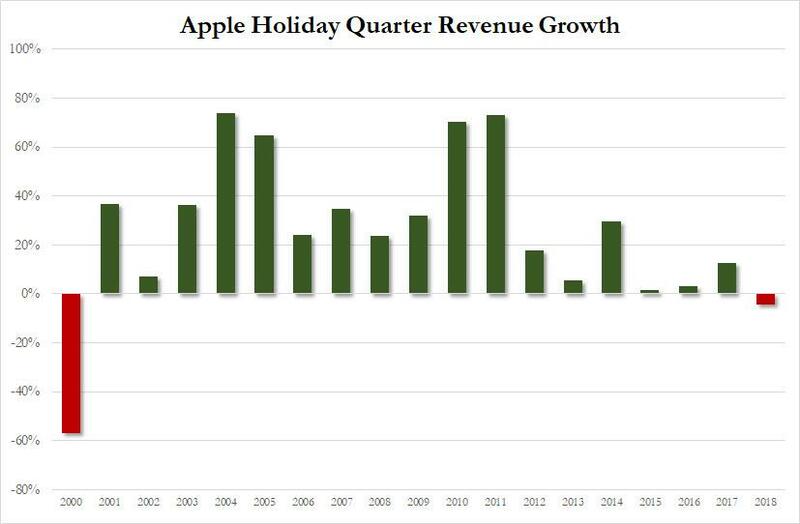 With Q2 revenue barely beating Wall Street estimates, this was the first holiday quarter since 2000 which saw a drop in Apple revenue. With Apple no longer breaking out unit sales, investors have to rely on revenue numbers, and for iPhones they were disappointing, as expected, as revenue declined 15% Y/Y to $51.982BN from $61.104BN a year ago. 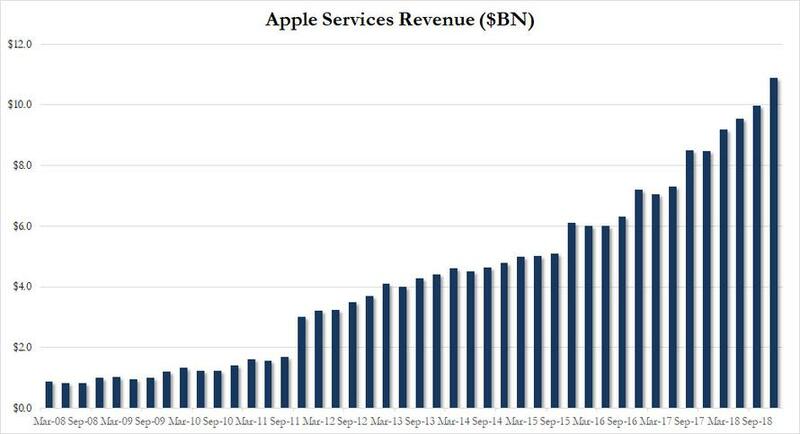 At the same time, total revenue from all other products and services grew 19% with services revenue reaching an all-time high of $10.9 billion, up 19 percent over the prior year. Of course with Apple desperate to pivot to a services driven business, it will have a hard time, because as Bloomberg Intelligence analyst John Butler notes, "Apple really wants you to think in terms of services, but iPhone still drives the bus." Apple also reported that revenue from Mac and Wearables, Home and Accessories also reached all-time highs, growing 9% and 33%, respectively, to $7.4BN and $6.7BN while revenue from iPad grew 17 percent. 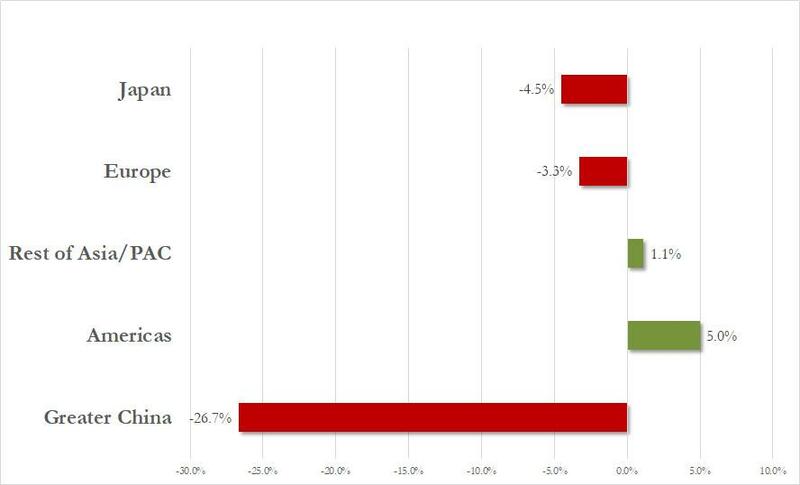 Meanwhile, for those curious just how bad Apple's China revenues were, the answer is the following: very. Because while Apple reported a modest drop in Japan and European sales, the 26.7% plunge in China revenue fully explained the company's guidance cut, with the drop in China sales amounting to nearly $5 billion (from $18BN to $13.2BN). Looking ahead the numbers weren't much better, with the company now forecasting revenue between $55 billion and $59 billion, on the low end of Wall Street's forecast of $58.97BN, and more importantly, another Y/Y decline compared to the $61.1BN a year earlier. Accorcding to Bloomberg's analyst John Butler, the $57 billion midpoint of Apple’s fiscal 2Q revenue guidance range suggests the company will ship 40.7 million iPhone units in the quarter. This assumes the device makes up 53% of total revenue and that analysts’ average-selling price view of $741 is accurate. Tim Cook also highlighted Apple's device user base is at 1.4 billion, meaning it grew by 100 million since the year-ago quarter. 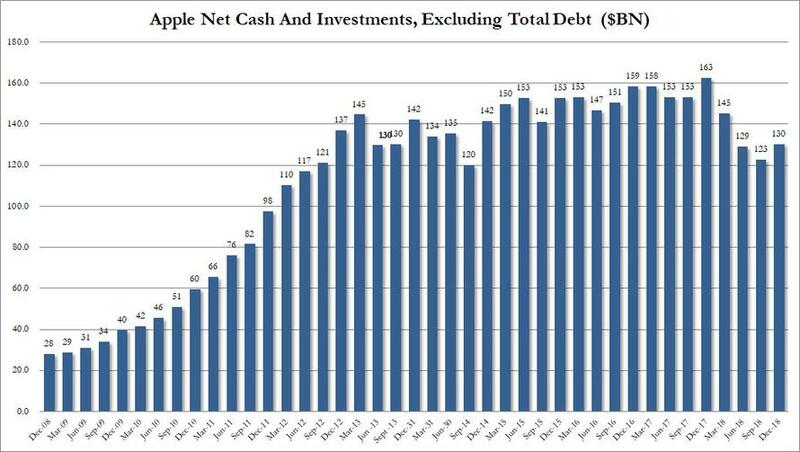 According to CFO Luca Maestri, Apple returned over $13 billion to investors during the quarter through dividends and share repurchases, with the net cash balance rising to $130 billion at the end of the quarter from $122.6 billion. Putting all this together, investors were rather happy with the earnings which did not contain any more shocks or surprises, and the stock was modestly higher after hours, rising just enough to fill the gap from the plunge following the Jan 3 guidance cut.